Dinner Guests: What Makes a Good One? Regular readers of this space may recall that my New Year’s resolution was to host more dinner parties. Heck, host a dinner party. Check. We’re talking a casual soiree with an interesting mix of adults around a table dining, wining, conversing, laughing, and generally having a convivial time of it. That was the idea. Let’s just say that it didn’t prove to be the reality for my first attempt at dinner party fun in 2010 and leave it at that, okay? How boring. Let’s not. Where to begin? It started with a health scare, cold feet, a dropped dessert, a man shortage, and angst on my end when I realized I’d be feeding three really good cooks, one of whom showed up almost an hour late (to be fair she did call), thus seriously messing with the meal timing. So by the time all my guests arrived I was just grateful that this group of women made it to my house. And I had a hunch they’d all like each other and hoped they’d overlook any deficiencies on the food front and we’d all just have a good time. My mistake. The latecomer asked if she could bring a friend. Feeling generous and in the spirit of growing community I said yes. Here’s the kicker, and there’s no way to sugar coat it: The ring-in showed up absolutely hammered. Who does that? We’re not talking tipsy and chatty, we’re talking unable to see straight, about to pass out in the plate, please-don’t-throw-up-at-my-dinner-table kind of plastered. It was uncomfortable and awkward, with my confused friends wondering why I would invite such an inebriated soul to my home for dinner. Their departure was followed by a sigh of relief, much giggling, and, natch, a discussion about what had just transpired. Here’s what we learned from the experience: More than food, music, and mood lighting the most important ingredient to a successful dinner party is the guest list. I’m not the only one in my circle who has had misadventures at the table. At a recent dinner hosted by a friend we’d both tried to redirect conversation when a couple who were a tad boorish talked about themselves a little too much. While such mishaps make for good blog fodder, we’d all like to avoid such scenarios again. So my friend and I started mulling over what makes a good guest — aside from arriving without too much alcohol on board. 1. RSVP. Do let your host know in plenty of time that you’re delighted to attend her dinner party. Not responding makes meal planning tricky and can hurt feelings. 2. Arrive on time. That means not too early and not too late. As a guide, if you’re asked to come at 7, then, ah, 7 is good. Later than 7:15 and you should call. Earlier than 6:50 expect to find your host scurrying around in her skivvies doing final prep and be prepared to fix your own drink and amuse yourself for a few minutes. 3. Bring a hostess gift. And choose something that doesn’t make work for the hostess. Wine, chocolates, homemade preserves, are all lovely. Flowers are also fine but offer to arrange them, as my friend did, while your host is busy with the business of looking after her guests. Or drop them off the next day as a thank you gift. 4. Offer to help. Dinner parties = lots of dishes so be prepared to pitch in. But do take no for an answer from folk who like to control clean up in their own kitchen. 5. Explain dietary restrictions in advance. Even if your host forgets to ask she’d much prefer to know ahead of time if you’re a lactose-intolerant, gluten-free, vegan, who shuns root vegetables and has a nut allergy. Honestly. She really, really, really wants to know this stuff before she plans her menu. 6. Take a polite bite. Unless you’re going to go into anaphylactic shock, be at odds with your god, or suffer an immediate, unpleasant reaction to what’s put in front of you, then your job is to try what the host may have spent hours making for the night. Or at least cut it up and move things around the plate. You don’t have to eat it all but you may actually find that those veggies you thought were disgusting — say, mushrooms or brussels sprouts — can taste divine when cooked well. 7. Come with an appetite. If you have an event in advance or after that precludes your partaking in the meal, take a raincheck for a time when you can eat what your host has gone to time and effort to prepare. 8. Avoid critiquing the chow. Trust me on this one: The cook will know only too well if the potstickers are a tad burned, the rice a little on the crunchy side, the soup overspiced…you get the idea…find something complimentary to say like “I love butternut squash,” and move on. 9. Show your best self. Plan on having fun. Hold up your end of the dinner-time banter, avoid too much work talk, don’t dominate the discussion, and include everyone around the table, especially shy types who may need some encouragement to join in. 10. Give thanks. A gracious thank you at the end of the night is the least a guest can do. A follow-up phone call, note, or email is extra nice, especially if you mention something specific about the evening that you found enjoyable. Now it’s your turn: Do you agree with this list? What would you add or subtract? Bonus points for sharing stories, good, bad, or downright ugly. Oh, and if you have words of wisdom about what makes for a good dinner party guest mix, bring ‘em on. Brava. Miss Manners couldn’t have put it better herself. We throw dinner parties rather frequently and part of the fun is figuring out who the guests will be. For a dinner party of 8, we generally include one couple from our regular rotation (our “anchors,” we call them) who can help set a tone of familiarity; a second couple with whom we’ve socialized but perhaps not entertained frequently; and a final couple who are relative if not total newcomers, but whom we feel would be a good match. In addition, we insist that couples not sit next to each other. This makes for a fun dynamic. Of course, we occasionally do parties of all anchors — these are the people, after all, we are closest to and enjoy the most. But it’s good to mix stuff up as well. Sean, I just knew I could count on you for some fabo dinner party guest list tips! You sound like a pro at such events & I’m discovering your dinners are legendary among a certain set. What you say makes total sense to me, and, in fact, my friend and I had pretty much come up with the same equation for our future entertaining efforts. So thanks for spelling out a recipe for success on the guest list conundrum. I’m sorry for your misfortune, but I wish I were a fly on the wall of your kitchen when you brought your friend in to ask what she was thinking bringing a drunkard into your home. That’s really shocking, but I’m giggling anyway. Can’t help myself. I’m terrible, terrible, terrible about throwing dinner parties. I hardly ever do it. Laziness? Fear? Who knows. Brunch is an exception… I love to have people over for brunch. Does that count? For the record: I didn’t drag my guest into the kitchen or anything. We just happened to find ourselves there at the same time and she was already apologizing for the shenanigans going on in my living room. And, of course, brunch counts. I like Sean’s term “entertaining.” I think I’ll scrap “dinner parties” it sounds a bit too formal and makes some gals think they have to frock up or something, which is fine if someone wants to, but not necessary. Snickering away, here in a Sac coffee shop, realizing I never sent a follow-up note (email, yes), and usually do, and despite the offending guest and my dropped dessert-it was a great time, food yummy, and all the hysterics gave us something to talk about after (and perhaps for years to come). On bad manners, I just heard from a co-worker (both chefs) that she and her husband invited a guest to dinner last weekend and served very expensive grass fed beef steaks (cooked medium rare), and their guest was appalled and refused to eat it. Shocking!! Yes, Nani, it was certainly memorable. Thanks for being such a good sport throughout the evening. Love your horror story — an expensive one too — ouch! Number 8 resonates with me. I can’t tell you the number of times I’ve had people over for dinner and they say absolutely nothing about the plates of lovingly prepared food that are put in front of them. I don’t expect adulation and awards, but a little “thank you, this is delicious” goes a long way towards quelling my paranoia that I’m a terrible cook, even if it’s not 100% heartfelt. No appreciation for “lovingly prepared food,” just rude, really, isn’t it? It also reminds me of my Australian-German friend Susi’s comment about her less-than-successful stollen she’d baked for her visiting galpals. It wasn’t her best, she ‘fessed up, ’cause it hadn’t been made with love — but rather in haste, our imminent arrival very much on her mind. Needless to say we told her it was delish & ate it up over tea & laughter. So well said!!! Sharing good food with good people is about as good as it gets. 11. Don’t complain about the neighborhood. Your hostess apparently likes the neighborhood or she wouldn’t live there. 12. Share the love. At least pretend you’re interested in all the other guests, not just the one you’re jonesing for. 13. Don’t expect the host to make clever conversation while cooking. Some people can do it, and some of us need all our brainpower to cook. 14. The hostess gets to choose the date. It is not OK to say “Oh, I can’t make it on that date, can we do it Saturday instead?” unless it’s your birthday party. 15. If you know who’s coming and you don’t like another guest, decline the invitation. Don’t tell the hostess not to invite someone because you hate her! Glad you liked it. And I agree with you, a host gift isn’t a necessity. I just wanted to stress if you do bring one, don’t make it work for the host. As for #s 11-15, you made me laugh — and I can’t argue with the sentiment. Good additions one and all. This is a great list! I especially like that in number 4 you included that guests should listen if the host says no. We often host a lot of people (22 at the last one) for multiple courses, so we end up with a big stack of dirty dishes. Expecting this, we have a specific spot where we put them when we clear one course so we can keep the sink and most of our counter empty for use in preparing later courses. Well-meaning friends don’t, of course, know this plan, but often won’t accept when we ask that they not bring their dishes into their kitchen. Now, onto stories. Both my husband and I really like to plan interesting menus and try out new techniques and foods with our friends. We like to throw somewhat elaborate dinner parties, plating each course for our guests and often making individual portions. Some of the menu items require that we prepare things several days in advance. For one party last summer, we served homemade ice cream with berry macerated in wine on ice plates. One of our friends called around 1 PM the day of the party to ask if he could bring a friend. There was a long story – guy going through a rough separation – so I said yes and asked him to let me know if the guy was definitely coming once he had a chance to talk with him. I immediately went to work on making another ice plate and reviewed the menu to see if we needed to go grocery shopping for anything additional. Around 4 PM, I called my friend because he hadn’t let us know if the extra guest was indeed coming. He apologized for not getting back to us but, yes, the other person was coming. We got plates ready and made enough portions to include him. And then, my friend showed up about 20 minutes late without the extra guest. I hear you, Maggie. No-shows with no legit excuse are super annoying! I’m so there with #5, especially if it’s a new dietary preference or quirk that I have no way of knowing … like you have given up (insert item here) for Lent or you read some book/saw some movie and have sworn of (insert item here) since yesterday. And, I would add … telling your hostess (who grew up in a food-is-love family) not to worry since you’ll bring your OWN FOOD to the event scores you ZERO points on many fronts. I totally get real food allergies (have some myself) and ethical food choices, but the way I was raised … being a “picky eater” is immature, rude or both. Roxanne, So glad you mentioned those folks who bring their own chow. Had completely forgotten about that phenomenon. Has anyone had to deal with that experience at their own dinner party? I have to say #6 is a biggie on my list as well. I’ll never forget having a friend come for a dinner I painstakingly prepared and watching him sit there during dessert, refusing to have any! The same thing happened when we had some relatives over for an afternoon. We got them drinks and I put out a cheese plate. They didn’t take a single bite. It just struck me as so rude. Obviously I put a lot of time into it – you could at least pretend to enjoy it. A hostess gift? Do I have to? Not that I entertain much but when I do, I don’t expect a gift. When invited elsewhere, I’ll ask what I should bring (and bring whatever they suggest). But otherwise I don’t make a habit of bringing gifts. Uh-oh … have I been breaching protocol all this time? MP, I agree hostess gifts aren’t strictly necessary. My major point here is that if you do plan to bring one DON’T make it something that makes extra work for the host when she’s running around like a blue-arsed fly trying to feed everyone. Excellent list, Sarah. There’s nothing better than a good dinner party, nothing tougher than one that fails for one reason or another. I’d add this rule for the host(s): try to relax and have a good time, and don’t hover anxiously over your guests. Hi Ruth, I totally agreed that guidelines (rules seem a tad harsh) for hosts are called for as well. In fact I plan to write a separate post on the subject. Totally agree with your suggestions on that matter. Anyone else want to chime in with ideas for what makes a good dinner party host? I don’t know if I’d categorize this a rule, but a suggestion for hosts is to have water on the table – it makes it easier for you and for your guests, especially if you’re serving something spicy. I agree with Ruth’s rule about trying to relax and have a good time. 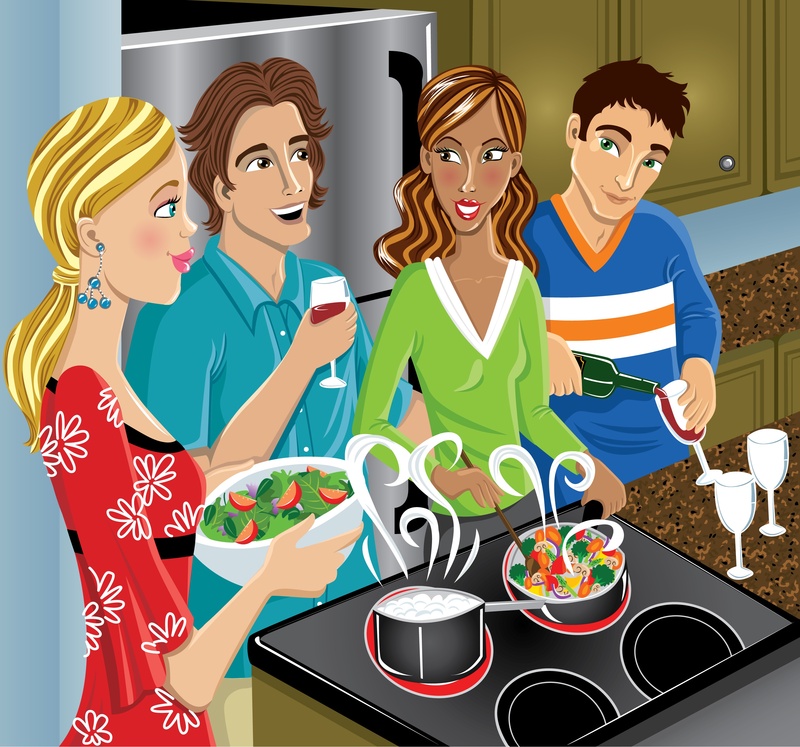 Most likely, the guests have come for the company more than the food, and they won’t feel at ease unless the host does. Oh, don’t we all have our stories about dinner parties-gone-bad! Loved yours. One thing that gets someone UNinvited to any future plans my husband and I have for entertaining is this: when you are opinionated about politics and are like a dog with a bone, not knowing when to shut up (especially when you are in a roomful of people who so obviously have opposite views!) A big NO-NO, in my book. I like a healthy debate as much as the next person but agree, Sheryl, that such boorish behavior isn’t conducive to an enjoyable evening. Not knowing when to say goodnight, ah, yes, I think I read somewhere recently that the Gettys just go to bed and leave their guests to their own devices. Does anyone else recall that story? And re: #8 – yes, the cook knows all too well if something isn’t right and will love you forever if you don’t mention it and even find something to praise! I find it interesting that in early- through mid-20th-century American etiquette it was actually rude to say anything – good or bad – about the food. The reason was two-fold – it too directly referred to the entire bodily/digestive experience of food (horrors!) and, perhaps more importantly, it was most likely that the host/hostess had not cooked that food anyway, so complimenting it was considered crass. Hi Molly, No argument from me on #4. My kitchen isn’t big enough for more than one and I have this system down that works in such a tiny space that I don’t expect others to grasp — or want to deal with on a social evening. As for #8: I didn’t know that historical tidbit, which is fascinating. Thanks for bringing it to my attention. I love how many of our social norms evolve over time and how something that’s considered courteous now was considered crass in the past, or vice versa. Great tips! Showing up late is one of my pet peeves. I’m part of a cooking club and we host potlucks once a month. A few times we’ve had friends of friends whose personalities just didn’t gel with the rest of the group. Maybe they drank too much and made inappropriate comments, but it’s always tough for the hostess to deal with, unfortunately. Yes, showing up late is rude. As a time-challenged soul myself I do appreciate it when people at least call to say they’re running behind. How hard is that? Great list. I especially liked the “know when to leave” amendment. I violated that one once, and realized I was the only guest left and the host was using toothpicks to prop his eyes open. Am sure you’re not alone, Lisa. I think I’ve been know to “close a place down” myself. Knowing when to leave is a good skill to acquire as a guest if you want to get invited back! I know people who could stand to use this info. And that scares me! Perhaps a not-so subtle email link is in order, Lisa;)? OMG I can’t believe that your friend brought a friend who was falling down drunk! Unbelievable! But it certainly makes for a good story (and I love that amazing illustration). These are great tips, too. I’m rarely invited to dinner parties but I am totally taking notes Sarah!! I bet a lot more people would entertain if they knew all potential guests would read this post! Now there’s a thought, Meredith. Number 5. Although it is incredibly considerate of a host to go to the time and trouble to cook for individual food restrictions, except for life threatening allergies, keep your request to a bare minimum. The time honored method of dealing with food issues is to snack before, give a convincing performance of eating along with compliments, and distract with interesting conversation. Too many guests are parsing down to the ingredients and thus discouraging non-chef type cooks from hosting. As a wedding professional, I am seeing brides reduced to tears as they try to build menus around multitudes of food issues. When asked about your food issues, please remind yourself that you are a guest, not a customer. You will not from missing a meal, but that you can also plan around your food issues. There are many more guests around than willing hosts, so make it easy for those hosting gems to continue their good work, with you on the invitation list. 11 Food-Related Goals for 2011.